Delight your niece with this birthday greeting! It's her special day, so remind her to do all the things she loves most. On her birthday, your niece can laugh and smile to her heart's content. 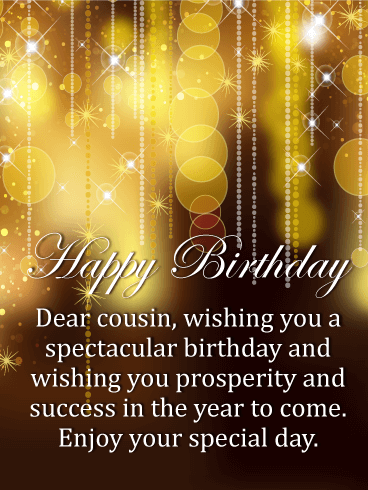 Send your niece a birthday message wishing her a day of blessing and a year of delight. She'll love this thoughtful birthday card delivered straight to her inbox. 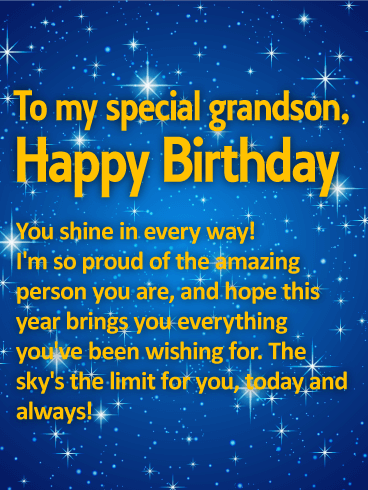 Surprise your out-of-this-world grandson on his birthday with this stellar birthday card! 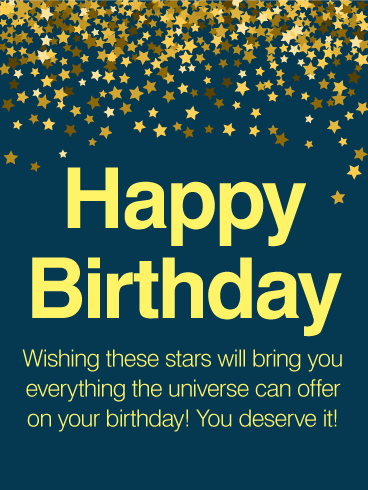 A starry night sky creates a brilliant backdrop for your heartfelt wishes, which let him know how special he is to you, and that he deserves the very best, not just today but every day. What a wonderful way to help him celebrate turning another year older! 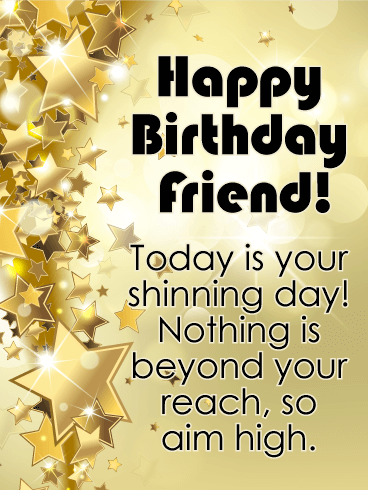 If you are fortunate enough in life to have that one person who shines down love and offers help to anyone in need, then wish that bright soul the best on their special day! 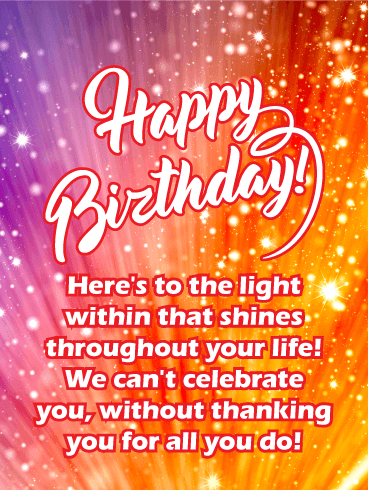 The Starburst - Happy Birthday Card for Everyone, says happy birthday, but also thanks that radiant human being for all that they do. Because a person isn't just a mind and body. They are the actions they choose to commit. The thump of a bass and winks from a disco ball might not be the party your aunt is looking for this year, but you know she's still going to go out and have the time of her life. After all, your aunt has a Ph.D. in Fun and you two have used that degree well over the years. Wish your aunt tons of fun on her birthday and let her know that you're always up for an epic girls night. 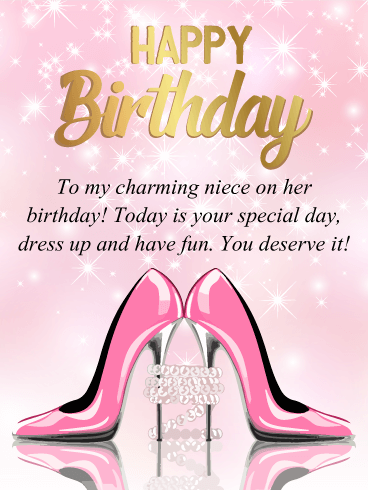 Send your niece a birthday greeting card that really shimmers and shines! This dazzling card is perfectly suited for a fun-loving and free-spirited niece on her birthday. 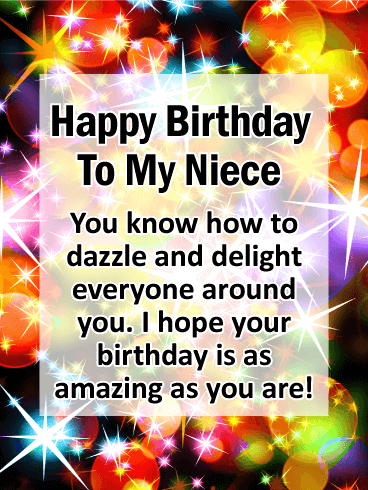 Let your niece know you think she is amazing with an awesome birthday card that says so! It's easy to send and guarantees an even more fun and thrilling birthday experience. Light up her life with this bright and colorful card today. 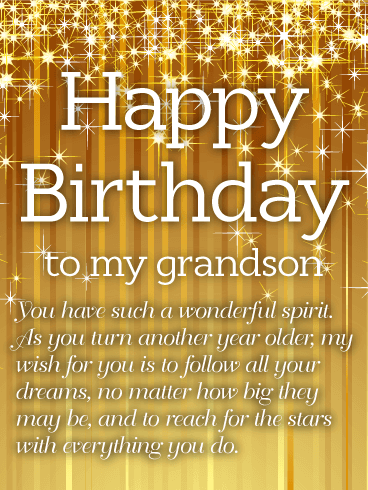 This sentimental birthday card will touch the heart of your adult grandson. A dark night sky is full of bursting fireworks, setting a bright and festive tone for his celebration. Just as impactful are the words, which speak to the person he has become, touching the lives of all the people around him with everything he does. It's such a meaningful way to remind this special member of your family just how much he shines. Just like the candles on top of his cake, this bright and shining birthday card holds all the excitement and anticipation of a wish about to be made by a very special grandson on his birthday! Gold stars twinkle behind a heartfelt message that will inspire and encourage him in the year ahead. 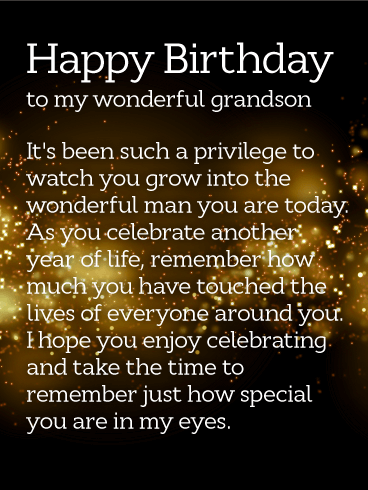 Whether you're there celebrating with your grandson, or thinking of him from miles away, this greeting is a wonderful way to let him know you remembered. Birthdays are a reminder that a new year is ahead and anything is possible! 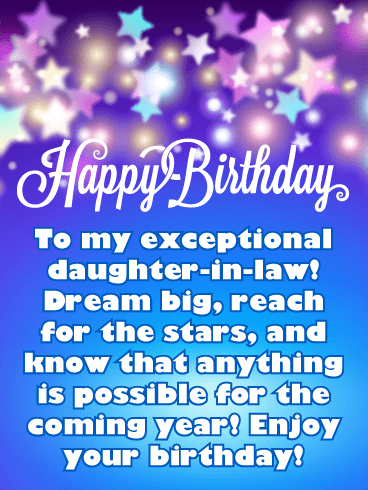 So remind your daughter-in-law to dream big and reach for this stars with this dazzling birthday card that was meant to inspire! It features fantastic colorful stars that are shining bright for her birthday! The fancy Happy Birthday lettering gives this birthday card a splendid look that will certainly impress her. Send these pretty stars to your daughter-in-law today so they can shine just for her on her special day! 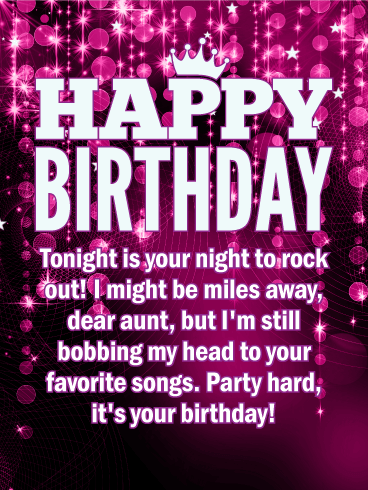 For when you don't want to just wish a simple "Happy Birthday" send this birthday card to let someone awesome know they are a true Rockstar! 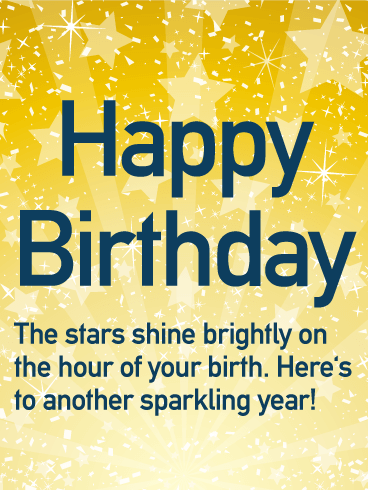 Stars explode over the top of this black backed happy birthday card, with the happy birthday text presented in cheery gold over a cloudy, blue sky! Guaranteed to encourage anyone to get their shine on! No doubt about it, mothers are super stars. For your mother's birthday, roll out the red carpet treatment. Her favorite foods. Favorite music. Shower her with attention and make sure she knows how fabulous and important she is. After all, there's no one like her in the world. So her birthday should be like no other too. Once in a while, the world will gift us with amazing people. And some of the best are the aunts who dealt with us from sticky fingers to teenage drama to first-child nerves. This year, for her birthday, be the world's gift to your aunt. Wish her joy and success, happiness and new found treasures. Your aunt is the best aunt you could have gotten. 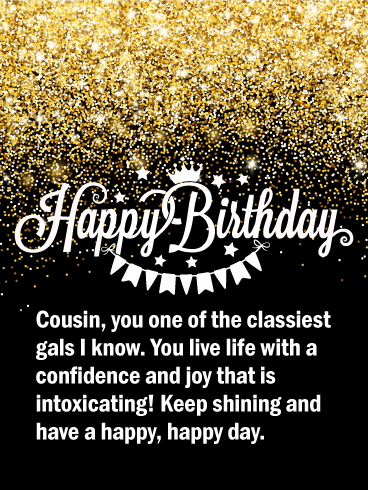 Now show her she got the best niece in return by sending this birthday card. Aunts are some kind of wonderful and all kinds of amazing! 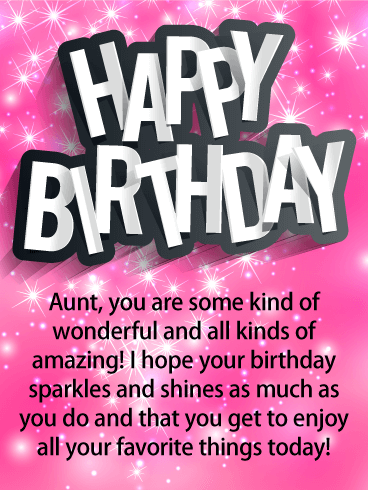 Send this super fun, glittery pink birthday card to your favorite aunt today. It's bright, its bold, it sparkles like your aunt's amazing personality! Birthdays are about having fun. 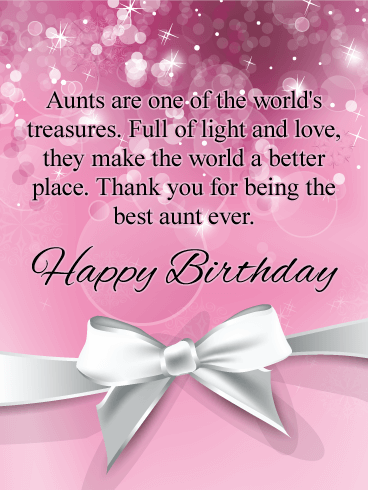 Add some fun to your aunt's day when you send her this fantastic birthday greeting card. Remind her to enjoy all her favorite things-she deserves it! 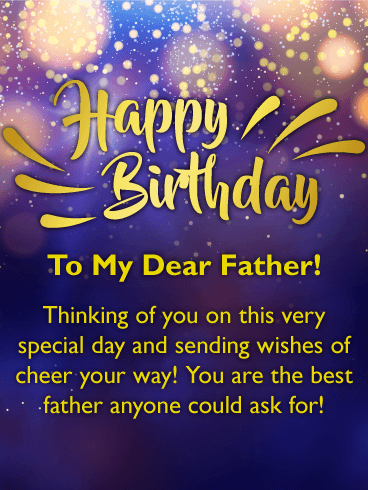 Send wishes of cheer to your father for his birthday with this exceptional happy birthday card! It showcases glittering gold sparkles against a purple background which gives this birthday card a festive look! 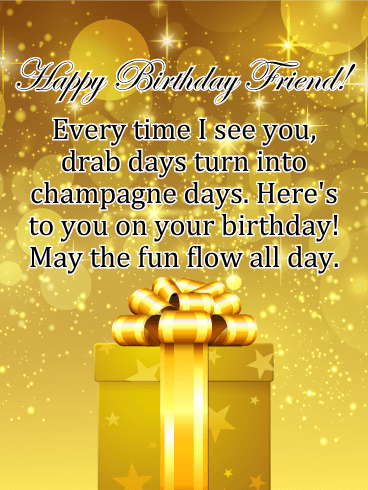 Happy Birthday is creatively written with letters of gold and makes this greeting card extra special. The message tells your father that you are thinking of him on his birthday and that you wish him a day of cheer! 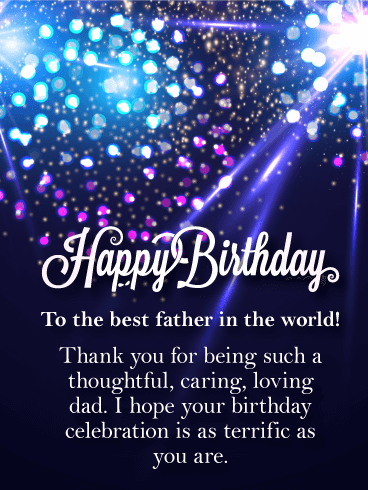 Send this sparkling birthday card to your father today! The super stars of our lives are the golden people of the world who put up with our gripes, bad jokes, and horrible tastes in music. In short, best friends. They've made the past years sparkle, so wish them the same on their birthday. 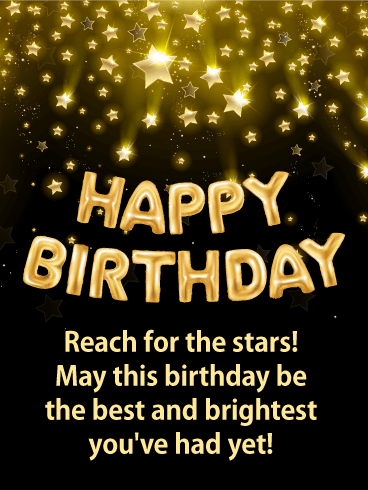 Send this birthday card and fill their day with glitter and light, make the day shimmer in the years to come as an everlasting memory. Today is their day to be a star and get what they want - birthday freebies and warm hugs from friends. Some friends have the ability to turn the most ordinary things into the most glamorous. They turn glum into glad and boring into exciting. You turn to them on sad days and hand over all party planning to their capable hands. But now it's their birthday and how can you make it special? With this glitzy birthday card of course! Full of fun and excitement, this card is full of wishes for a spectacular day. Make their day shine. 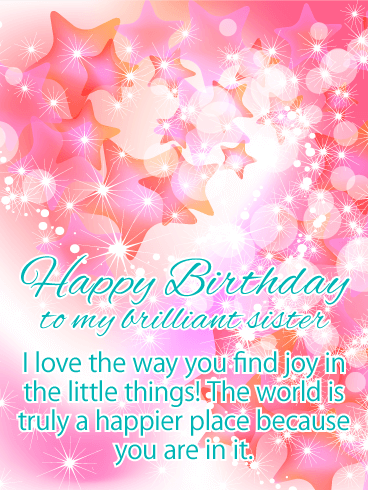 Dreamy and cosmic, this glittering birthday card is for a sister who is brilliant like a star. 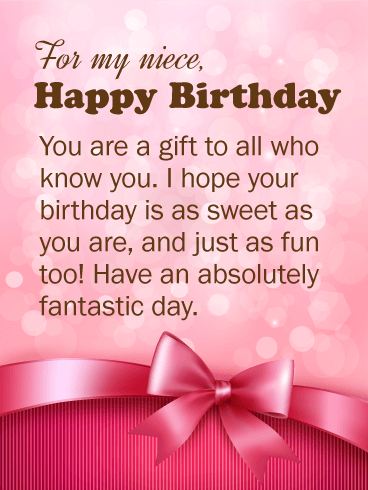 Celebrate your sister's birthday with this swirling pink birthday greeting card. It lets your sister know how much you admire her optimism and confidence. The world is a better place because your sister lives in it! Tell her so with this charming and heartfelt birthday greeting card. 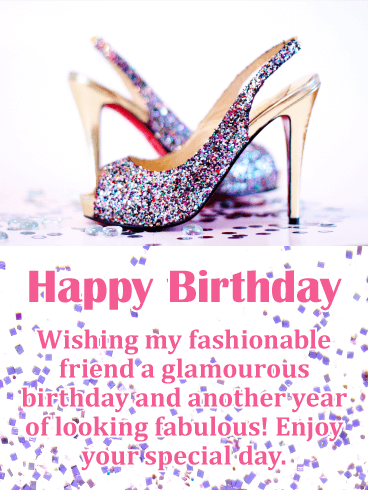 Send your fashionable friend a birthday card that will make them realize they still look fabulous! It will add some happiness to their big day! This exciting greeting card showcases a beautiful pair of glittery and sparkling high heel shoes! These stunning heels will remind your friend that it's time to celebrate and have a glamorous birthday! So walk these pretty celebration shoes over to your friend to wish her a happy birthday in style! Best friends are some of the most important people in our lives. From the minute you met your friend, you knew she would always hold a special place in your heart. With this Happy Birthday card, you can celebrate the amazing person she is and the incredible relationship you've built together. 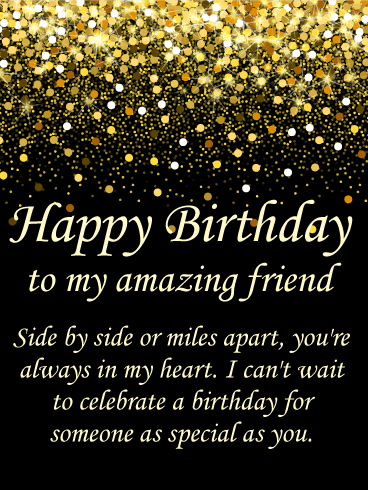 No one is more important to you than your friend, so make this the best birthday she has ever had! 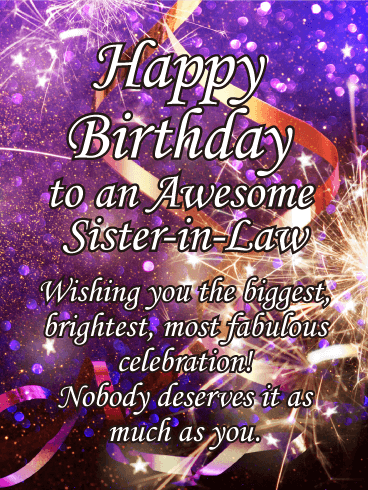 When you want to celebrate an awesome sister-in-law in the biggest & best way possible, this birthday card is definitely the way to go! A fun & festive background, filled with streamers, lights and gold sparklers, will put her in the mood to party, while your big, bold wishes in front will help her have the most fabulous day ever. After all, nobody deserves it more! 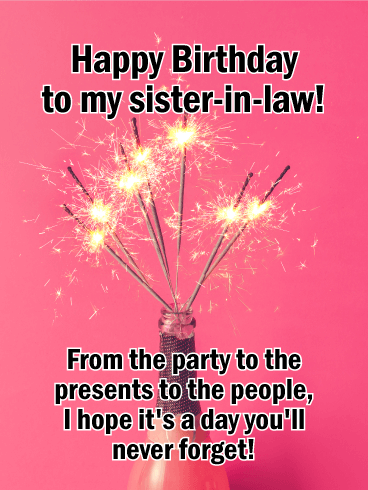 Your sister-in-law makes every day feel like a party, which is why she deserves a birthday card that's worthy of a celebration! A bottle of Champagne is lit up with brilliant sparklers, bringing fun & excitement to this fabulous & feminine pink greeting, which flaunts your best wishes for a day she'll never forget, full of presents and all the people she loves most! 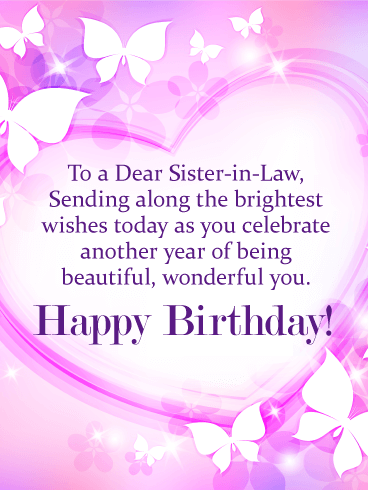 She's someone who means the world to you, so on her birthday, make your sister-in-law feel extra special with this lovely birthday card to celebrate the beautiful, wonderful person she is. A shimmering purple heart is surrounded by delightful butterflies to bring a smile to her face. And your lovely words are sure to make her feel loved and remembered. Add some sparkle and beauty to your daughter's birthday with this stunning butterfly birthday card! It features a colorful glowing butterfly with a trail of spectacular lights! Your daughter will absolutely love it! 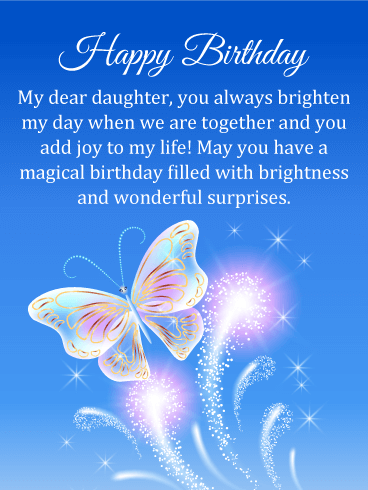 This birthday card tells your daughter that she brightens your day and adds joy to your life, your daughter will enjoy reading this on her special day! Let this lovely butterfly wish your daughter a happy birthday without delay! Sometimes it's mind-boggling how awesome mothers are. 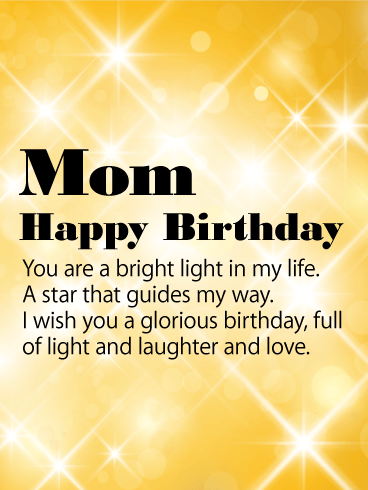 This year, show your mother just how amazing you think she is with this shimmering birthday card! Filled with love, your mother will adore this card. It's sure to fill her day with joy and allow her to carry you in her heart the entire time. 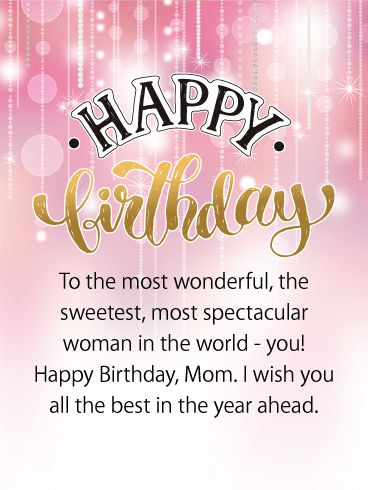 Give your mother the best birthday and the best year by sending this birthday card! 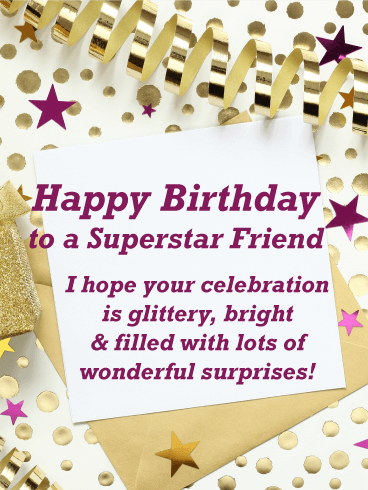 If you simply can't let your friend's birthday go by without giving them the superstar treatment, this is the birthday card to send! Festive, golden touches and shining purple stars surround your heartfelt words, wishing them a day filled with lots of wonderful surprises! Send a little excitement over to your father with this spectacular birthday card! It's bursting with sparkling lights and dazzling fireworks that perfectly represent the importance and thrill of this big occasion. This birthday card says that it is to the best father in the world. Imagine how happy your dad will be when he reads this on his birthday! So let the fireworks and the celebration begin by getting this terrific birthday card over to your father today! Remind your niece that today is the day to dress up and have some fun! It's her birthday and she deserves it. This birthday card displays an image that will get your niece excited about looking her best for her birthday. It features pretty high heel shoes with a pearl necklace wrapped around the heels. She will also love the sparkling pink background and gold lettering. All these elements come together to form a spectacular birthday card! 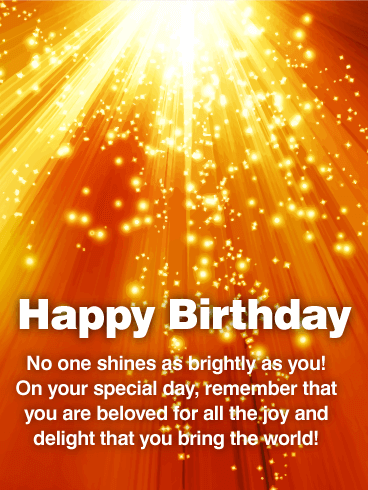 This birthday card shines just like the birthday boy's smile will shine when he receives it. Golden glitter raining down on your message of happiness and another great year of life make for a thrilling gift to receive when he opens his email inbox. 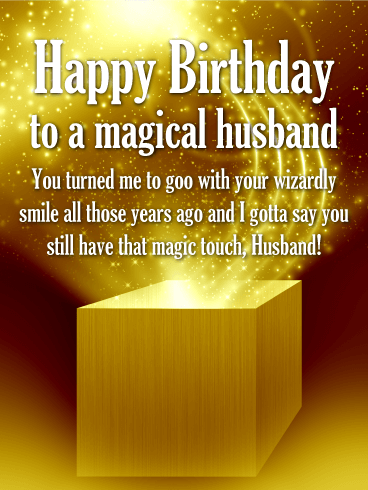 Let him know you think he's a special person when you send this birthday card to him. Whether she's miles away or right by your side, your friend is always in your heart. On her birthday, let her know you're celebrating her. 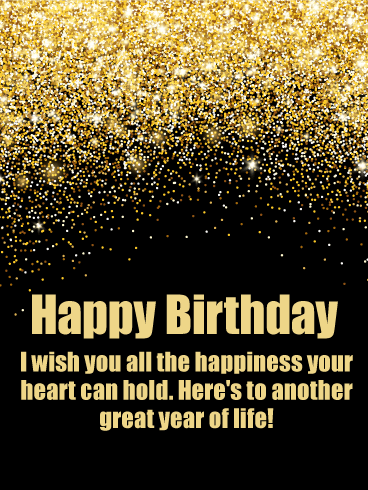 This birthday card features golden glitter raining down on your birthday message over a black background. Tell your sister she's the shining spot in your life with this birthday card filled with glitter and rose petals on a background of various shades of perfectly girly pink. 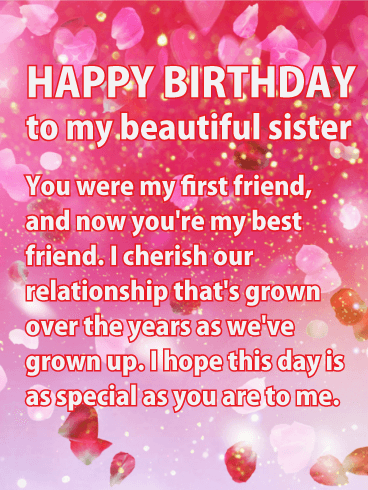 She was your first and best friend, so tell her that she still means the world to you on her birthday. 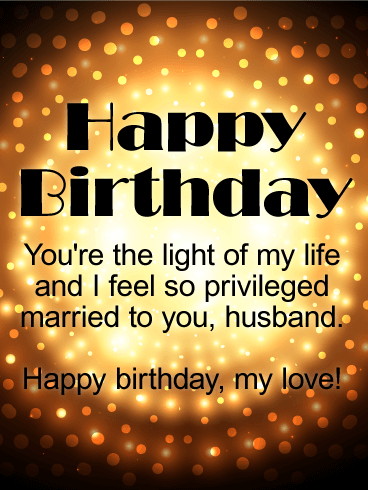 Light up your husband's world on his birthday! Your husband is a warm man, an afternoon's sun you love to bask in and feel so special to be tied to. He's your guiding star. Today, his birthday, is the day to tell him how much he means to you. Share the warmth he brings you by gifting your own. Wish your husband on this day "Happy Birthday" and watch his smile burn brightly. The world is made more beautiful by the special people in it. Your niece is one of those people. 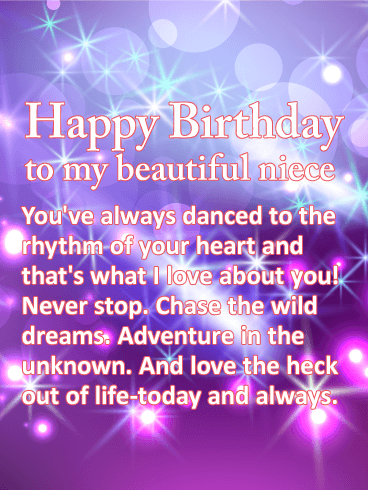 Honor your niece's life and send her this beautiful birthday greeting card. The sweet birthday message is heartfelt and sincere. 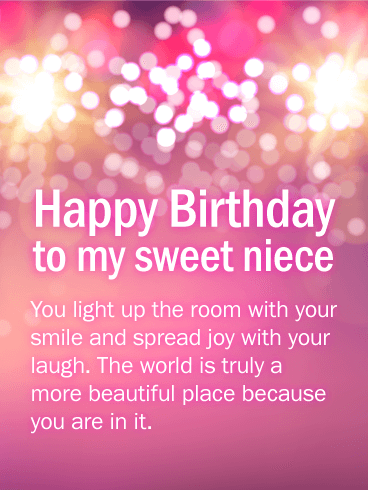 With an easy click of a button, you can send a gorgeous message across the miles to warm your niece's heart this birthday. A birthday as sweet and as fun as your niece! You niece deserves only the best on her birthday, so why not start with a beautiful birthday card? 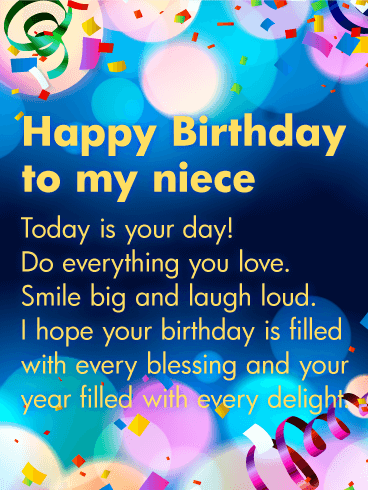 Send your niece a thoughtful birthday message for an absolutely fantastic day. She may get many lovely gifts on her birthday, but her life is the greatest gift of all to those around her. Make sure you let her know it with this super sweet birthday greeting card. Unique, stunning, and adventurous. If your niece knows how to follow her heart, this is the birthday card for her. Remind your niece to always chase her wildest dreams and live for the adventure. Life is unpredictable and beautiful-go after it! 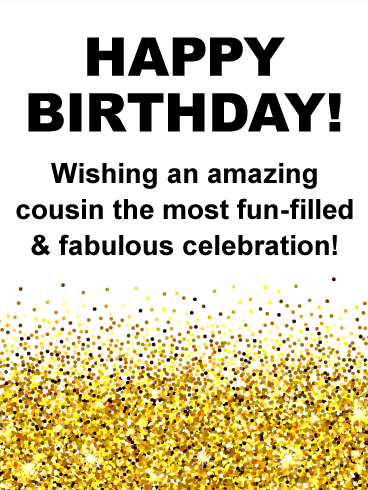 Send this fabulous birthday card to your niece and make it a great day. Spice up her birthday with a gorgeous card that celebrates her life and free spirit. Is someone important in your life celebrating their birthday? Then you need a birthday card that rejoices in the star that they are! Like this birthday card, this person twinkles! Make sure to show them how important they are to you and wish them all the best dreams in the world. With navy blues and glittering golds, a person can't help but feel loved and cherished upon receiving such happy birthday wishes! A birthday card for a radiant personality! 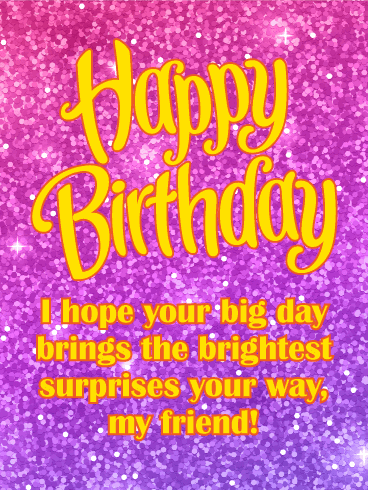 If someone in your life brings sunshine to everyone they know, let them know how special they are and how much you appreciate their beautiful soul with this bright and energetic birthday card. This birthday card speaks of celestial celebration. Bring a smile to someone's birthday by reminding them of how brightly their presence shines on the world! This festive birthday card will express the joy that you feel in celebrating the recipient's special day.